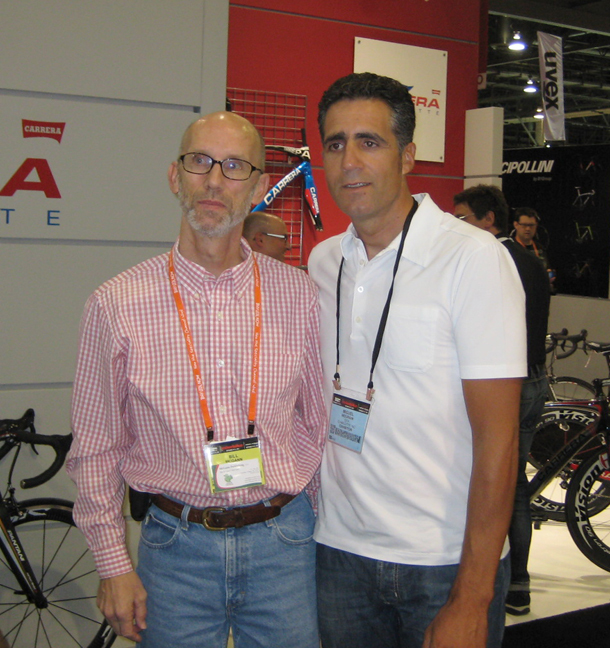 This is not an attempt to be a comprehensive report on the 2012 Interbike show. We went to the show to wander the aisles and see old friends. Every so often a stand would have something we found interesting. 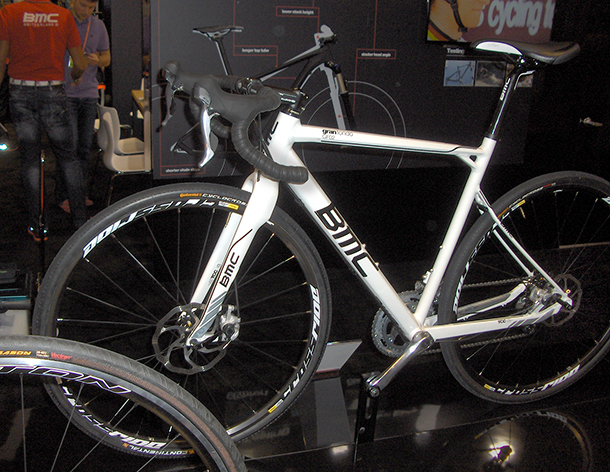 Here's what captured our attention as we wandered the aisles of Interbike 2012. 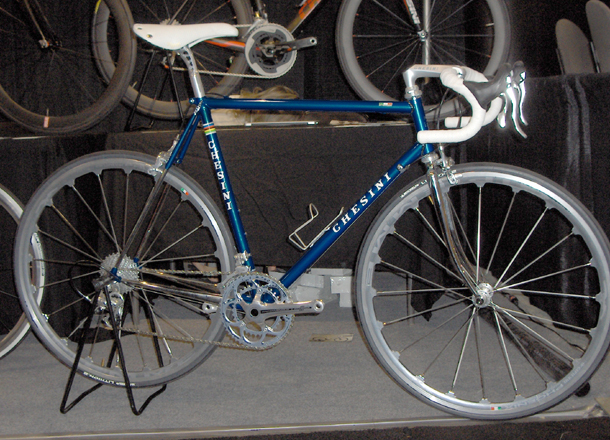 I was hoping to see the Colnago C59 disc brake road bike, but alas, Colnago was nowhere to be seen at Interbike. Colnago has gone all-in with the disc concept, the C59 sporting Formula brand hydraulic brake levers that are compatible with Shimano DI2 electronic shifting. 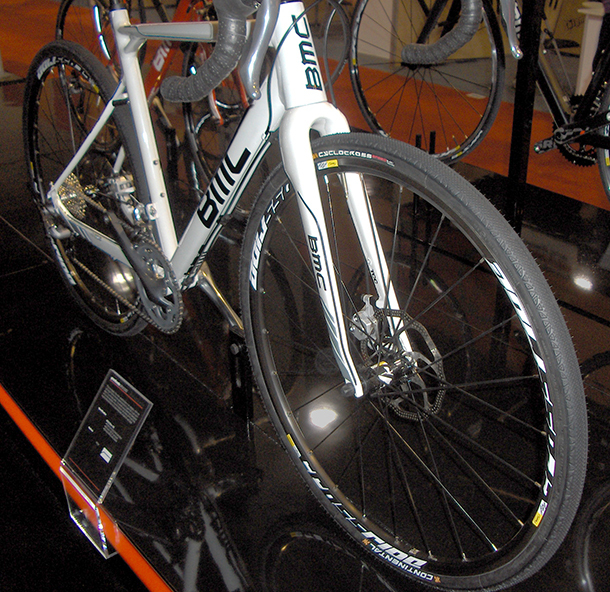 The only disc road bike I saw was the BMC Gran Fondo GF02, which used a wire-activated disc brake. The BMC representative said the bike makers are waiting for integrated hydraulic-brake/shifter levers (Colnago's seem to be proprietary) before getting serious about disc brakes, plus the UCI is doing a go-slow at this point. The UCI wants to make sure having riders with different brakes (calipers on carbon rims versus hydraulic discs) won't create a safety problem. 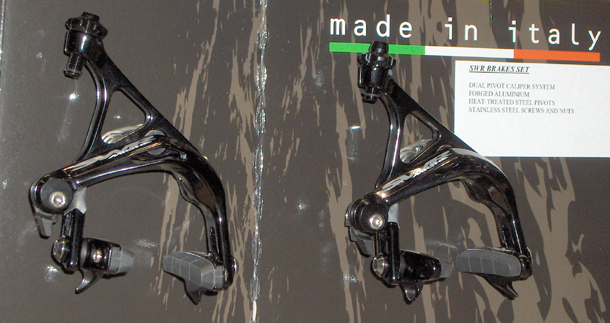 Some bike makers are also hoping for more streamlined, better looking disc calipers and smaller discs. The latter probably won't happen given the need to dissipate heat on long descents. Another view. Critics are right. It would be nice if the industry comes up with better-looking calipers. I'm guessing this will all get worked out and the problems of braking with carbon wheels will become a thing of the past. 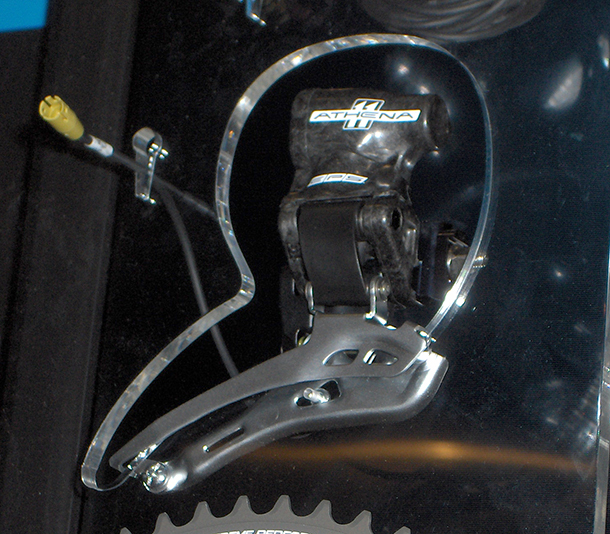 Campagnolo left its 2011 line basically unchanged with one significant exception, the introduction of Athena with electronic shifting, which Campagnolo calls EPS (Electronic Power Shift). Just as a refresher, the Campagnolo groups are, from most expensive to the cheapest:	Super	Record,	Record,	Chorus,	Athena,	Centaur	and	Veloce. All	are 11-speed except Centaur and Veloce, which are 10-speed. Until now now, only Record and Super Record have electronic availability. The expectation was that Chorus would be the next group to get EPS, but instead, Athena was updated. The logic of the decision was impeccable: Campagnolo wanted to get OEM (original equipment manufacturer) business. That is, getting their product used to make production bikes, and the less expensive Athena ($3,000 suggested retail for the group) does a good job of meeting the needs of many bike factories. 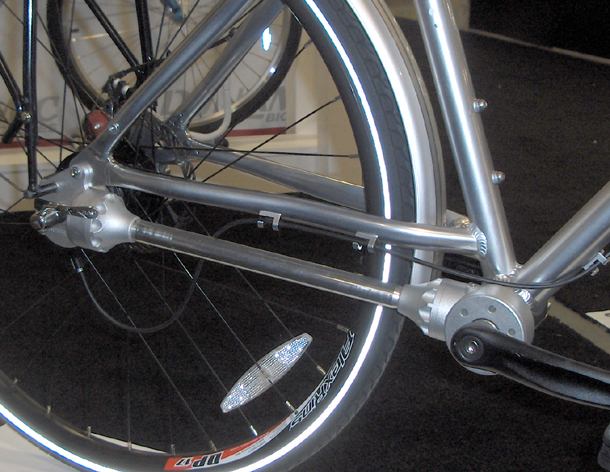 Plus, the all-aluminum group goes well with steel bikes, whose buyers have a tendency to avoid carbon components. The Athena electronic group derailleurs use the same motors (and design geometry) as on the higher-end groups, so the shifting is identical. 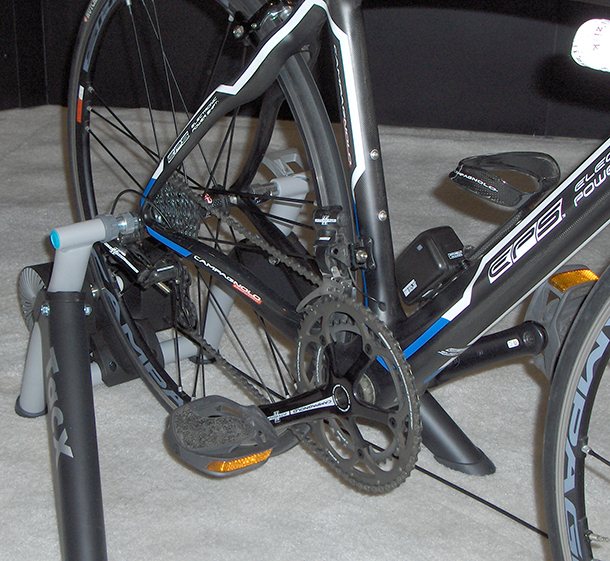 I tried the test bike mounted with Athena's EPS in the Campagnolo booth and I liked it. I really, really liked it. 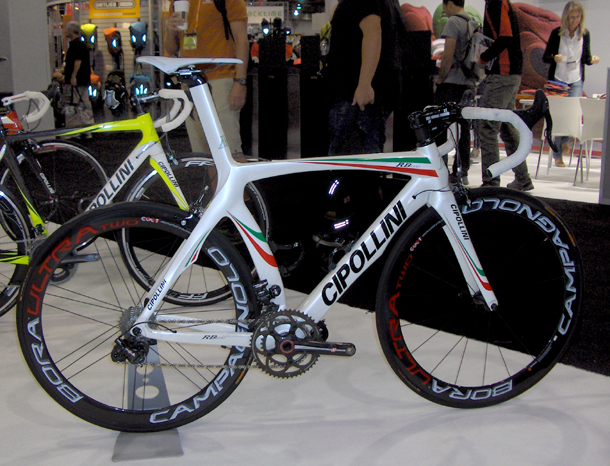 Cipollini makes a point that their bikes are made in Italy, even going so far as to explain its supply chain. It's not that there's anything wrong with bikes made in Asia. I want a world industry. I want bikes made in Italy, USA, China, Taiwan; bike factories everywhere making good stuff. But I don't want brands importing low-cost Asian product and trying to convince buyers that they are made in western artisan shops. That chaps my hide. So kudos to Cipollini. Here's their RB1000 carbon bike made specifically for road sprinters. Mario Cipollini had crowds everywhere he went in the show. There were lines of people wanting to have their picture taken with him. He really is the Lion King. There is a healthy trend toward larger cross-section tires that I hope continues, and Challenge is rising to the occasion. The belief that super-narrow tires (18 and 19 mm tires were very popular just a few years ago) are faster seems to be headed to the ash bin of history. 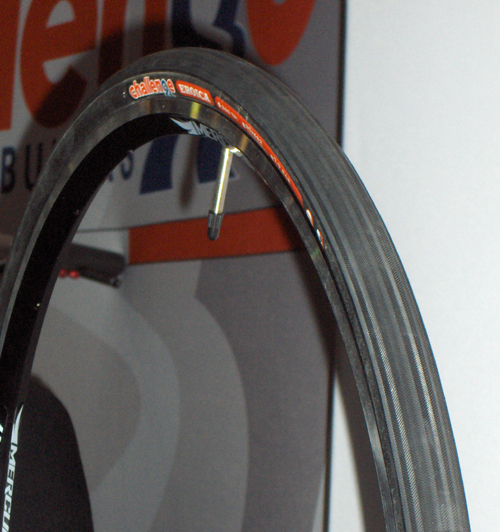 Challenge Tire boss Alex Brauns says the pros are moving even from 23 mm tires to 24 and 25 mm cross sections (their 280-gram Strada 25 tubular and open tubular meet this need) and for the northern classics, are asking for 27s. The 260-gram Paris-Roubaix is 27mm wide and comes in both tubular and open tubular (clincher made with sew-up technology) configurations. 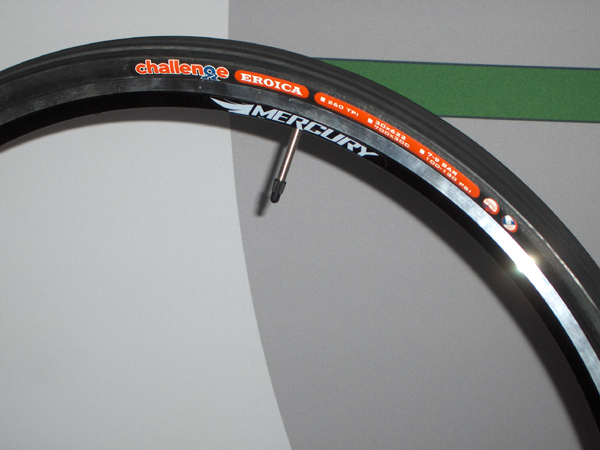 But what really warmed my heart was Challenge's new 30mm wide Eroica. 30mm wide! Yes, 30 mm. Designed for races like Italy's Eroica Strade Bianche (white, or unpaved graveled roads), it looks like just the thing for the roads of Arkansas, where I live. 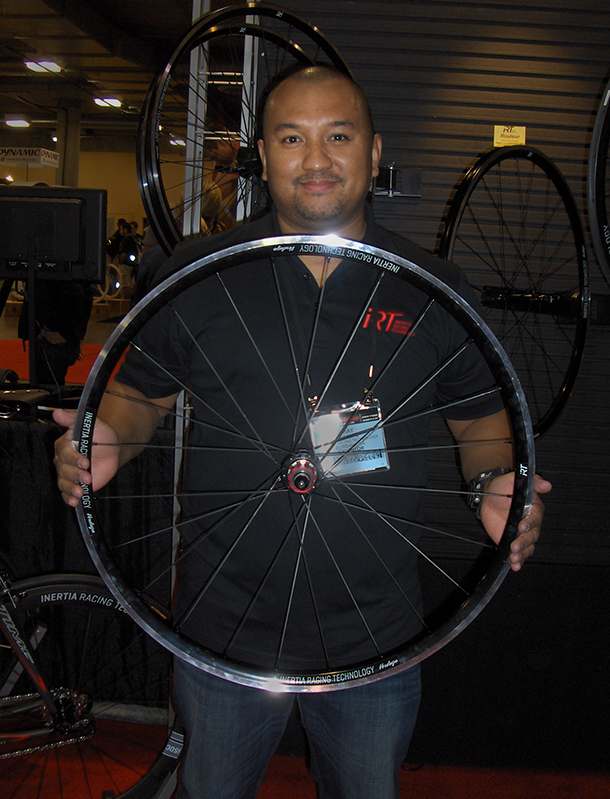 It weighs 360 grams and is made with a 260 tpi casing and can be had in either tubular or open tubular configuration. I was warned that carbon frames with tight clearances might not accommodate the Eroica, but steel frames should have no trouble. Another reason to ride steel. Challenge Eroica 30mm tire. It's hard to see in this picture how fat this lovely beast really is. Alex is sending me a set and I'll review them after I've had a chance to put some miles on them. Challenge has a new time-trial tubular, the Crono SL, 250 grams, made with a 300 tpi casing and can be inflated up to 175 psi. Here's what's really cool: The Crono SL is made in one of the old, original Clément molds which features a low rolling resistance side tread that still offers good cornering. 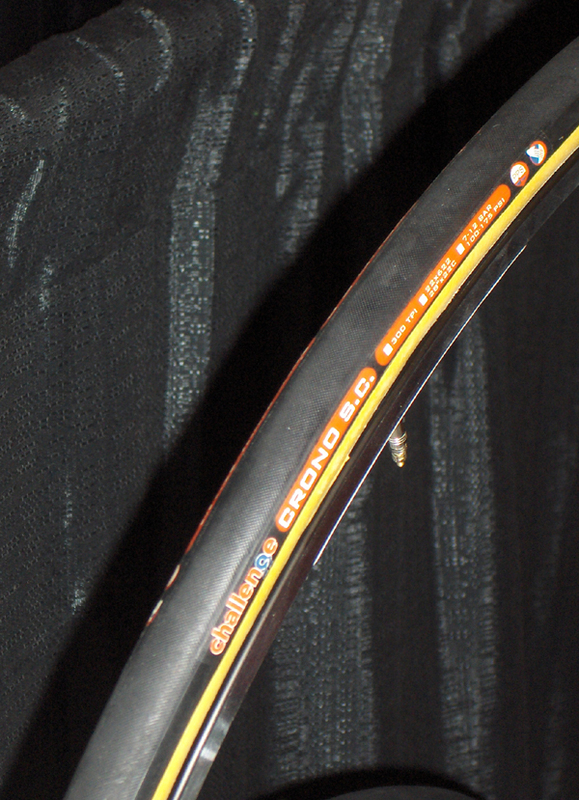 A beautiful hand-made tubular, a tire the way God intended them to be. Challenge has an American warehouse now, which should make life easier for distributors and allow for greater availability of their tires in the United States. Chesini, an old (since 1925), familiar and well-liked brand was a welcome sight at the show. The traditional lugged steel bikes produced in their shop in Verona stopped me in my tracks. The bike in the picture replicated the lovely 1980s steel bikes that those of us with grey stuff growing out of our heads remember with such fondness. 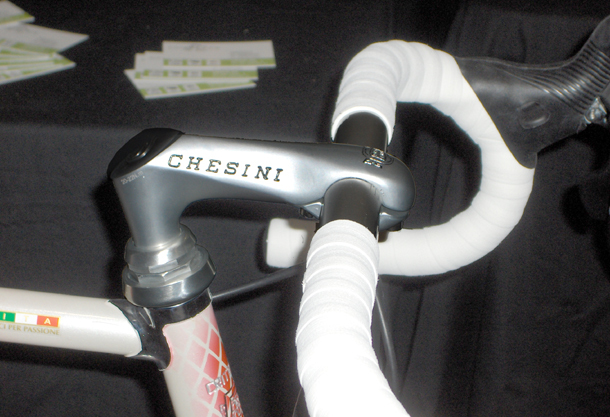 Not only does Chesini make bikes the way they should be made, they can pantograph (engrave) stems. Hot spit! 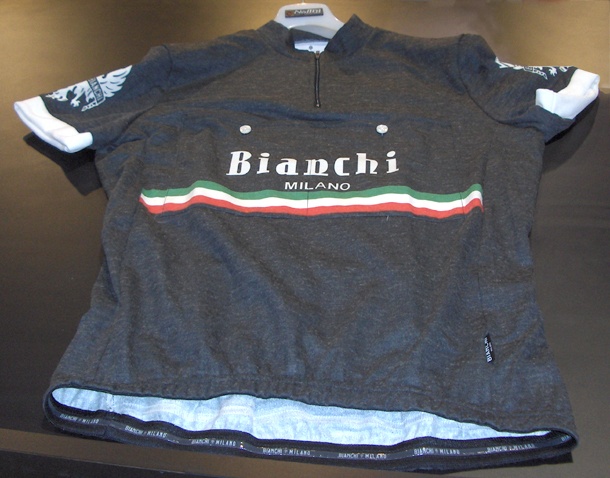 Get me a wool jersey and a pair of Clement Criterium silks glued to Fiamme Ergals and I'm in heaven. Chesini is looking for an American distributor. Chrome on the seat stay caps and the Regal saddle were nice touches, even if the wheel choice was unfortunate. Still, a sweet-looking bike. Haven't seen a pantographed stem in years. There really is only one way to make a city bike, and that's with a shaft drive connected to an internal multiple-speed hub. No greasy chain, no dirty derailleur jockey wheels. It's all clean and out of the way and there are no filthy moving bike parts to catch and soil a commuter's clothing. Shaft-drive (or chainless) bikes have been around since the late 19th century, but have never caught on. The French Métropole came out in 1896 and the great bicycle entrepreneur Albert Pope spent years working out the bugs before betting his company on a shaft drive bike. But they were expensive, and heavy. That was then and this is now. 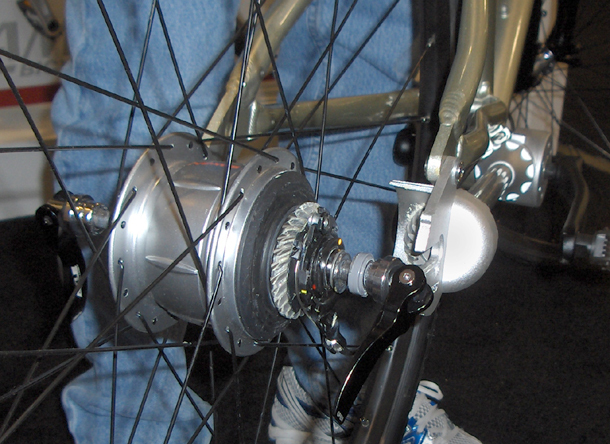 Dynamic Bicycles has a clean and neat drive unit using spiral bevel gears to transfer power to a Shimano Nexus 8-speed internal hub. If I rode a bike in grown-up clothes this is what I would ride. 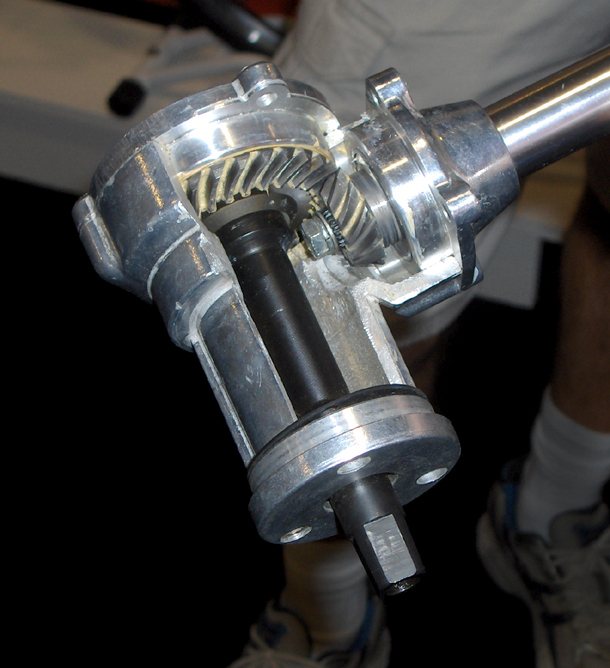 How it works: The crank spindle gear connection to the drive shaft. Pulling the rear wheel out for a repair. Not as simple as with a derailleur bike, but not rocket surgery either. 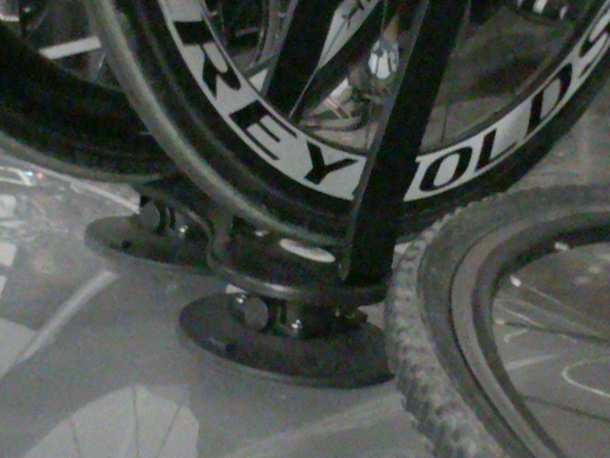 It's a commonplace that rollers are the best way to train indoors. They help a rider imporve his balance and develop a smooth, straight-riding style. But most riders don't bother learning the skills needed to ride rollers, preferring modern trainers. Perhaps Elite has come up with a product that will make rollers (which have been around since the 19th century) more attractive. Rapidly rising IRT had a busy booth despite what I thought was a poor location in the lower level of the show hall, which speaks well for the reception owner Ray Asante is getting for his wheels. 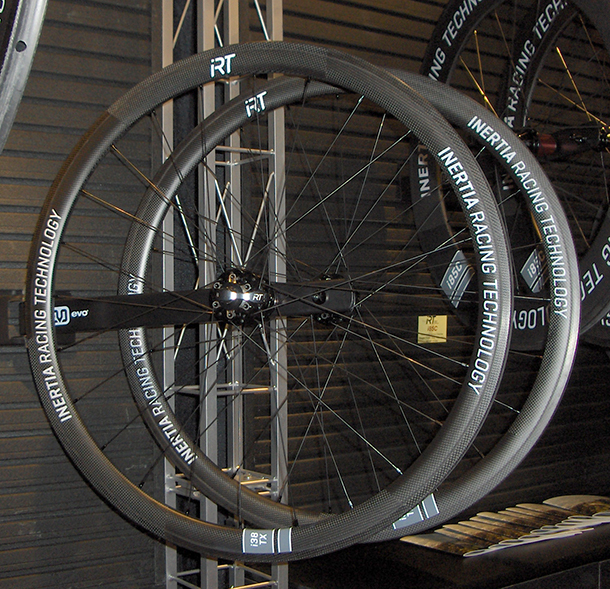 IRT offers a neat option; some wheels can be ordered with custom wheel builds onto Powertap hubs. Italian component maker Miche had new dual-pivot brake calipers called "SWR" on display this year (Miche displayed carbon fiber calipers last year). They were simple, elegant 331 gram grabbers with stainless steel hardware. Miche's general manager told me Miche's owner is constantly investing in the factory to keep their component production in Italy. Campagnolo isn't the only brave holdout. Bravo Miche! Just after finishing talking with the gents at Miche, one of cycling's great strolled by, Davide Boifava. Boifava was more than a good pro (2 Giro stage wins), he managed several famous teams, including Carrera, Mercatone Uno and LPR. Signor Boifava agreed to do an oral history interview next year. 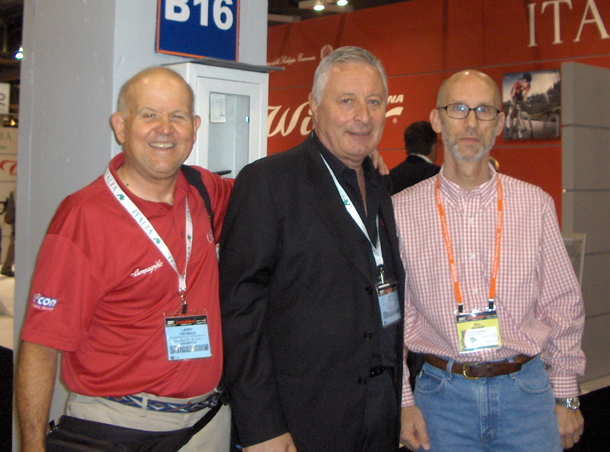 The smiling gent n the red shirt is Larry Theobald of CycleItalia. My first visit to the Nalini (otherwise known as Moa Sport) factory near Mantua in Italy was an eye-opener. One large building held looms knitting fabric that would later be sewn into jerseys. For many garments, Nalini is vertically integrated with thread and ink coming in one door and jerseys out the other. Despite the company's size, I've always found Nalini clothing to be comfortable and extraordinarily durable. Today I wore a well-used Jolly Componibili - Club 88 jersey from about 1990 that still looks sharp. Every Nalini garment is x-rayed before it is shipped, catching things like stray needles that might be hidden in the clothes. I learn something new every day. 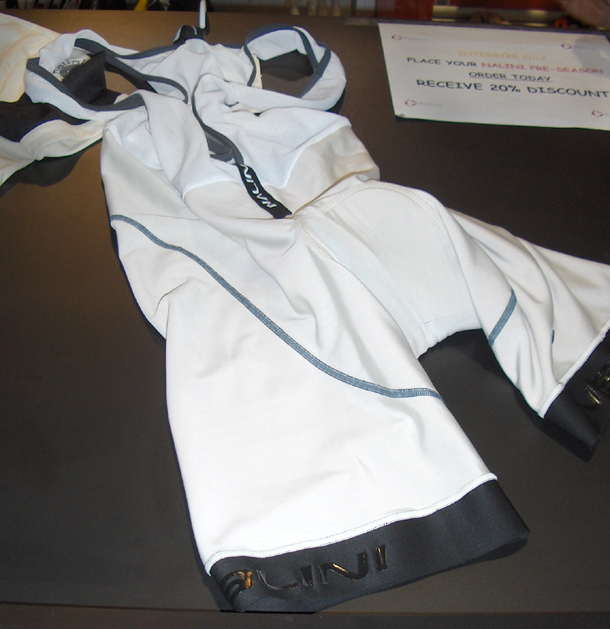 A pair of bibshorts caught my eye. They didn't feel like lycra, but were properly stretchy and had an almost silk-like feel. As I was walking past the Pella Sportswear booth, a little voice in me said I knew that name. "Wasn't there a pretty good pro in the 1970s named Adriano Pella, rode for SCIC, perhaps?" I asked. Indeed, Adriano Pella, who turned out to be a teammate of Vittoria Shoes founder Celestino Vercelli, was the Pella clothing guy. 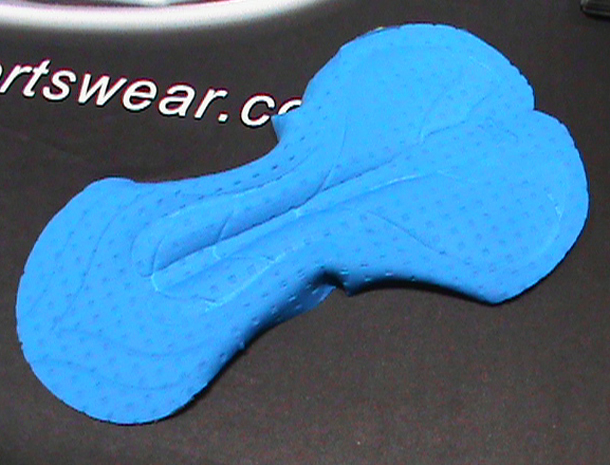 What Pella has new is their "Ergo Pad", a cycling short insert (I guess I can call it a chamois) with an algea-based anti-inflammatory that is slowly released as the user rides. Miguel Indurain looks ready to race. I merely look baffled. Prologo was showing their "CPC" (Connect Power Control), which looks like a jillion tiny, flexible volcanoes embroidered on the surface of their saddles. 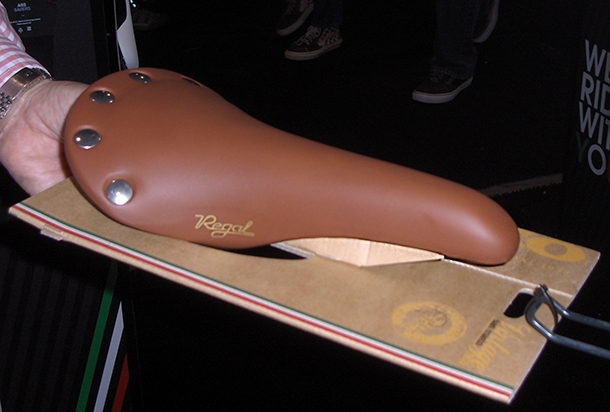 Prologo says they help absorb vibration, make the saddle stickier and allows for better air circulation. Prologo was also displaying gloves with the CPC treatment. 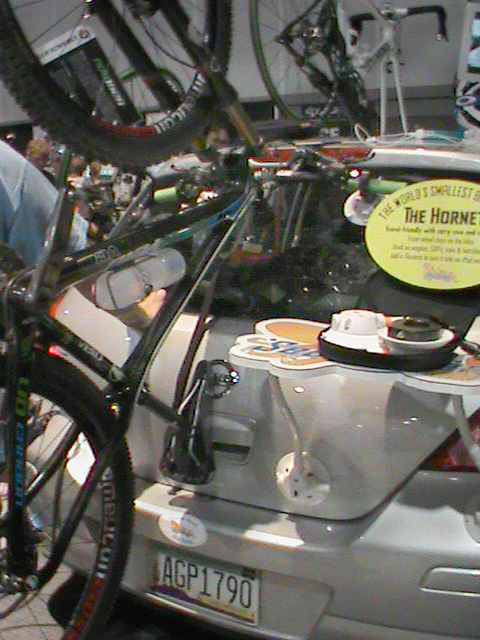 I wasn't ready for this clever idea, bike racks that stick to the car with suction cups. A little vacuum pump in each suction cup (with a little gauge so the user can know if the vacuum is holding) firmly attaches the simple rack to the car. I apologize for the poor quality of the pictures, the stand was in a dark corner of the hall and packed with interested dealers. Here's a roof rack held with suction cups. A close-up of a suction cup. 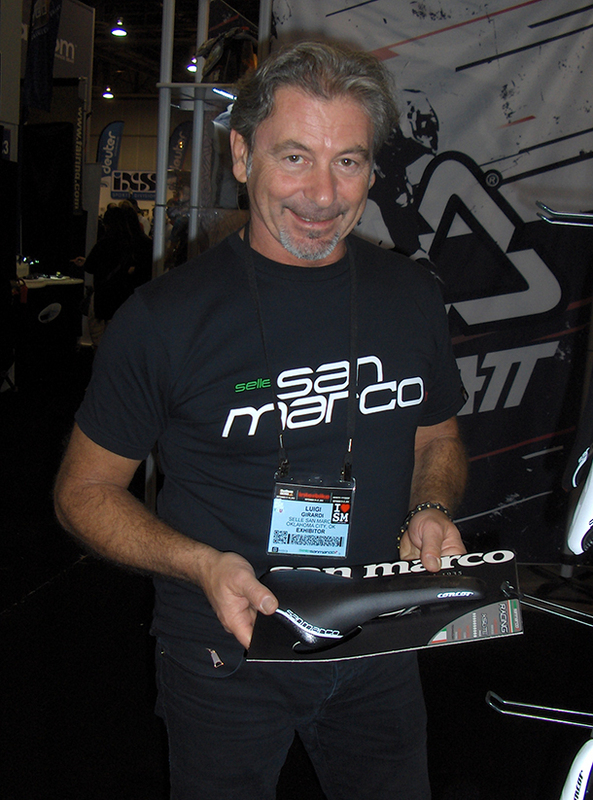 For most of the last two decades I've been riding San Marco saddles. I find them comfortable and very durable, making them economical in the long run. Back in the 1980s, the San Marco Concor was red hot, Everyone wanted one, it seemed. 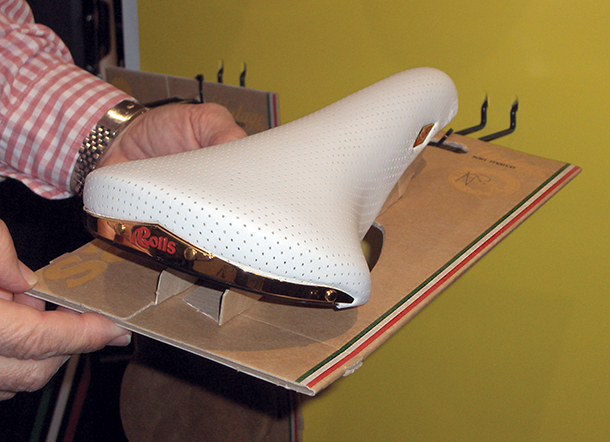 San Marco is bringing out a line of saddles based on that classic shape. The new Concor comes with or without a hole in the center and with rails in carbon (160 grams), hollow Xsilite (proprietary San Marco rail material) or hollow Manganese. 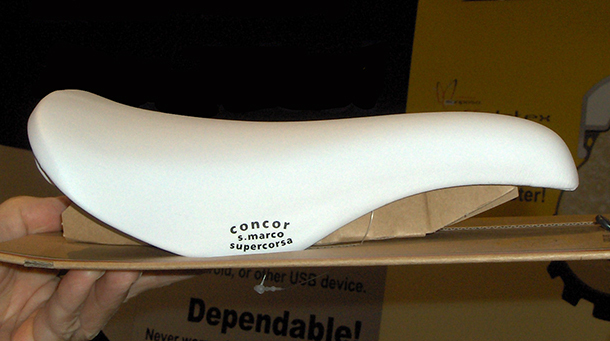 It turns out the classic saddles of the 80s and 90s still have a market, people who cherish their comfort and look and are less concerned about weight. Remember the Regal? You can still get it. And of course, the Concor. I think this little 20-gram unit was the biggest deal in the whole show. 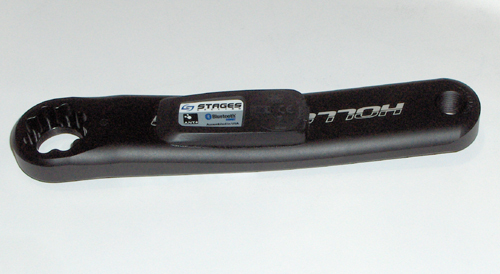 Stage One power meter is a little strain gauge glued to a left crank arm that talks to a smart phone. No expensive hub, no special crankset. The strain gauge measures deflection under load and an accelerometer in the unit measures cadence (crankspeed). That gives force times velocity, and voilá, we have power! 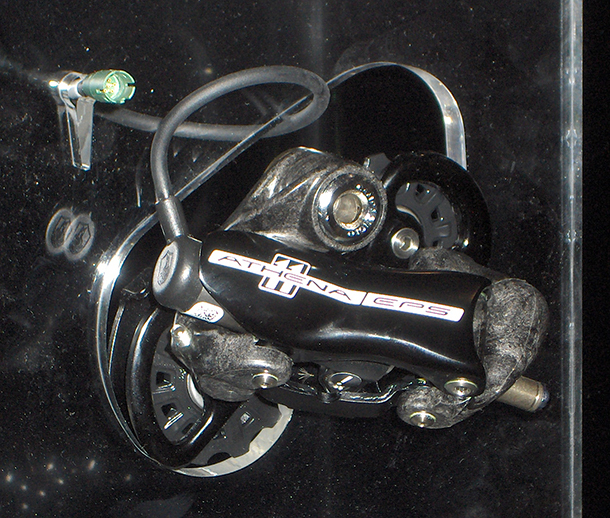 Stages has left cranks for most of the commonly used cranks, allowing mountain bikers to have a dynamometer. It assumes there is little difference in the power output of the right and left legs, which their data show to be true. The little unit talks to a smartphone, where an app translates the input from the crankarm into usable information. 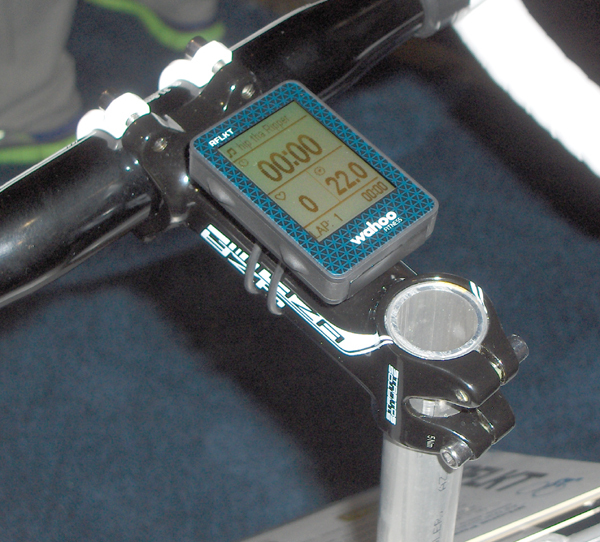 Put one of those cool little Wahoo RFLKT units on the bars and you don't have to mount your smartphone on the bars, just carry it in your jersey. Disclaimer: I don't know if the RFLKT will have such a compatibility when the REFLKT comes out, but it ought to. Uusus Wheels, whose factory is in Rosá, northeast of Vicenza, Italy, not only makes wheels, it supplies hubs to other wheel makers. 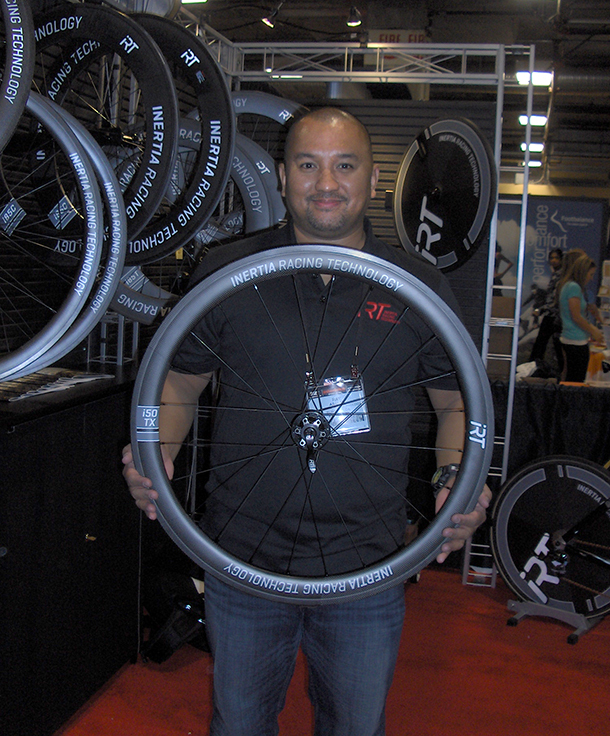 They currently supply wheels to the Farnese Vini pro team. 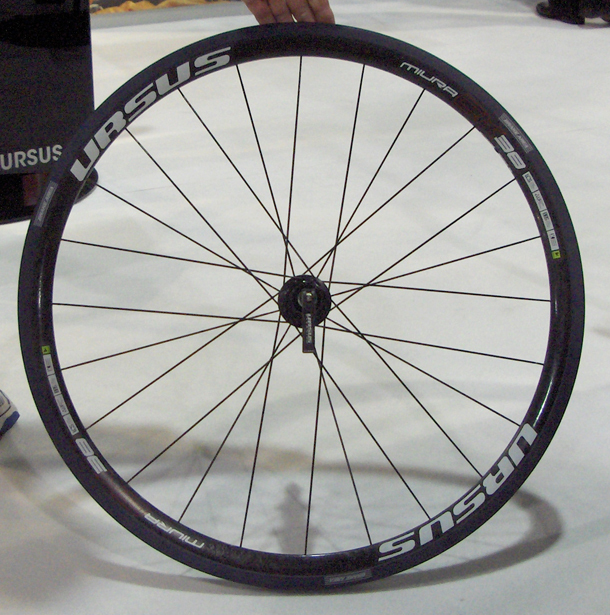 Pictured is the Ursus Miura CK38 carbon clincher wheel with ceramic braking surface plus a ceramic coating on the rest of the carbon rim that the maker says imparts greater strength. The front wheel weighs 675 grams and the rear is 805. I liked the 2012 "Hora shoe" with its well thought-out cable closure. Now Vittoria has the "Hora Evo", a higher-zoot version of the Hora. 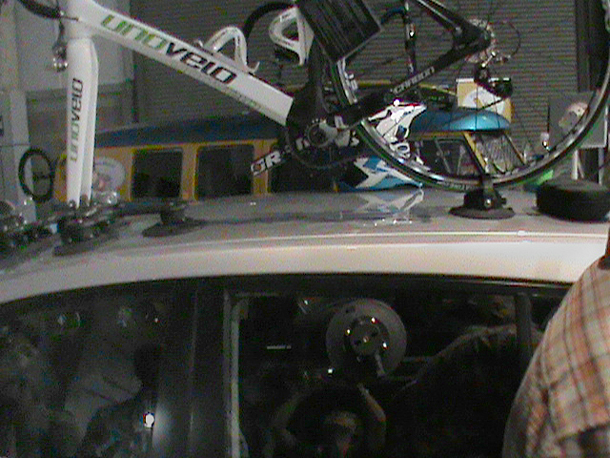 I brought a video cam to Interbike to show the Hora Evo and how simple cable closure system is to use and service. 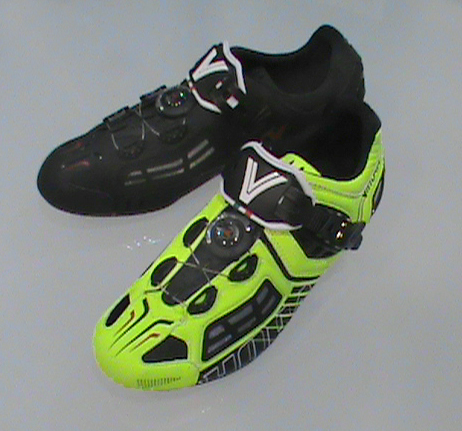 Alas, my "footage" of Vittoria boss Edoardo Vercelli explaining the shoe is unusable. My apologies. Please take my word for it, the whole buckle and cable fixture system is serviceable by anyone. The whole system is a brilliant piece of Italian design. The Hora Evo comes in men's and women's versions. The full carbon sole is only 3mm thick. Mesh vents have been added to the sides, back and soles of the shoe. Weight of a single size 41 shoe is 297 grams. I have a pair on the way. I can't wait. The Vittoria Hora Evo looks infinitely better than this screen shot. Go to their web site to see how lovely these shoes really are. I've	been	to	the	factory	several	times. Vittoria	shoes	really are made in Biella, Italy. Really. 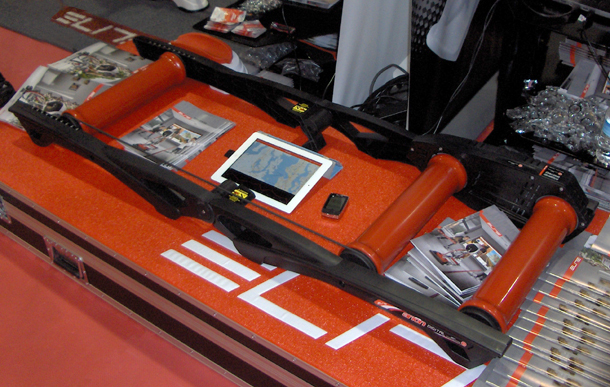 Don't want to mount your smartphone on your bars? Wahoo's RFLKT (coming out later this year) is a little unit (2.4" x 1.6") you can mount on your bars that will display info from your smartphone while it stays safe and warm in your jersey pocket.